We can add the basic settings of the plugin here. 1. Publish wordpress `pages` to tumblr – If you want to publish the wordpress pages to tumblr, enable this option. 2. Publish wordpress `posts` to tumblr – If you want to publish the wordpress posts to tumblr, enable this option. 3. 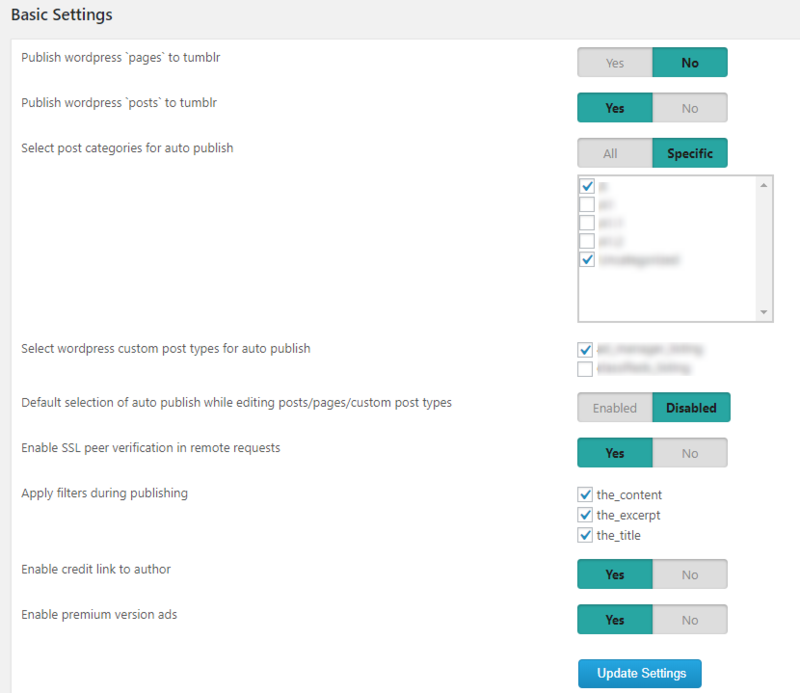 Select wordpress categories for auto publish – Here you can select all your categories or specific categories for auto publish of posts. So the posts under the selected categories are published automatically to tumblr. 4. Select wordpress custom post types for auto publish – If you have any custom post types in the site and want the posts in these types for auto publish, please select the types. 5. Default selection of auto publish while editing posts/pages/custom post types – If you want to publish to tumblr when editing a post or page or custom post type, please enable this option. 6. SSL Peer Verification – This is the setting of verifying the ssl connection with external site. It is better to use the SSL peer verification. In some site the SSL peer verification is not available and then you can disable this option. 7. Apply filters during publishing – Please select the filters if you want to apply these filters while publishing the post. Enable the apply filters in order to evaluate all the functions attached to the specified hooks from other plugins as well as theme. 8. Enable credit link to author – Enable this option for a credit link to the plugin author. 9. Enable premium version ads – You an enable/disable the premium version ads here.